Our regular readership will be well aware that, as a team, we cover menswear and culture from modern London. As we explore the culture behind contemporary men’s style we like to delve into British heritage whilst considering the influence of modern minimalism. Our search for quality minimalist menswear brands often takes us to the shores of Scandinavia, and, on this occasion, things are no different. Today we are writing to champion Danish watch brand Nordgreen and providing a Nordgreen Philosopher watch review. Nordgreen’s founders are Pascar and Vasilij; two lifelong friends, watch enthusiasts, and born-and-bred Danes who are on a mission to deliver true Scandinavian design and lifestyle to everyone. True Scandinavian lifestyle & design, made accessible. The pair of impassioned Danes became disillusioned with the contemporary watch market and thus decided to act. They created Nordgreen. The “Nord” represents Nordic identity. Nordgreen not only strive to capture the sophisticated minimalism that is so inherent in Scandinavian design, but aim to integrate Danish values into everything they do. They actively work to inspire trust, encourage cooperation, and foster an open and honest environment between the brand, their employees, their partners, and their customers. The “Green” captures Nordgreen’s emphasis on sustainability. the watch specialists take the necessary steps to ensure that their products and processes are as sustainable as possible, exemplified by their recyclable packaging and partnerships with sustainable manufacturers. At Nordgreen, the Scandinavian values of generosity and social responsibility always come first. 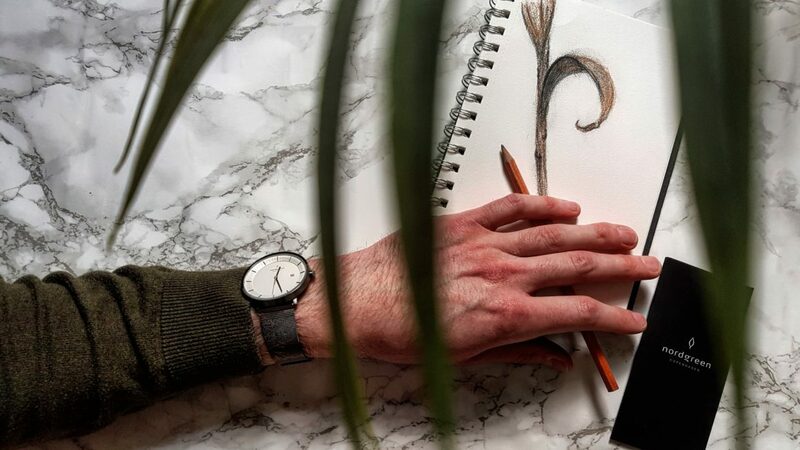 Guided by traditional Scandinavian design, a love for watches, and a desire to completely change the way we look at them, Nordgreen knew there was only one designer who could bring their vision to life: Jakob Wagner. Wagner is one of Scandinavia’s most heavily awarded and respected designers, with over 20 years of experience designing for international companies including Bang & Olufsen, Hay, Muuto, and B&B Italia. In that time, he has honed a style that is quintessentially Danish: elegant, simple, balanced, and timeless. What sets him apart, however, is his ability to integrate functionality into his designs. 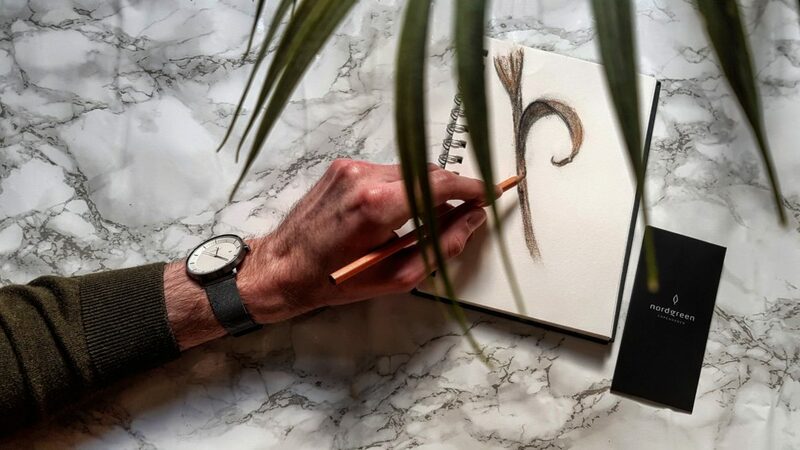 Wagner’s background in mechanical engineering grounds his designs in the user experience, so that in everything he creates, he carefully considers not just the look of the object, but how its user will want to interact with and create a connection to it. With his ability to strike the perfect balance between minimalism and functionality and his artistry in embedding Danish values into everything he creates, Jakob Wagner is Nordgreen’s key to making true Scandinavian lifestyle and design accessible. Your design is just right, where it is the simplest expression of an idea. Danish values dictate that taking care of one another is paramount. Not only do Nordgreen want you to feel good about the quality and design of the watch you wear, but they also want you to feel good about what your watch stands for. 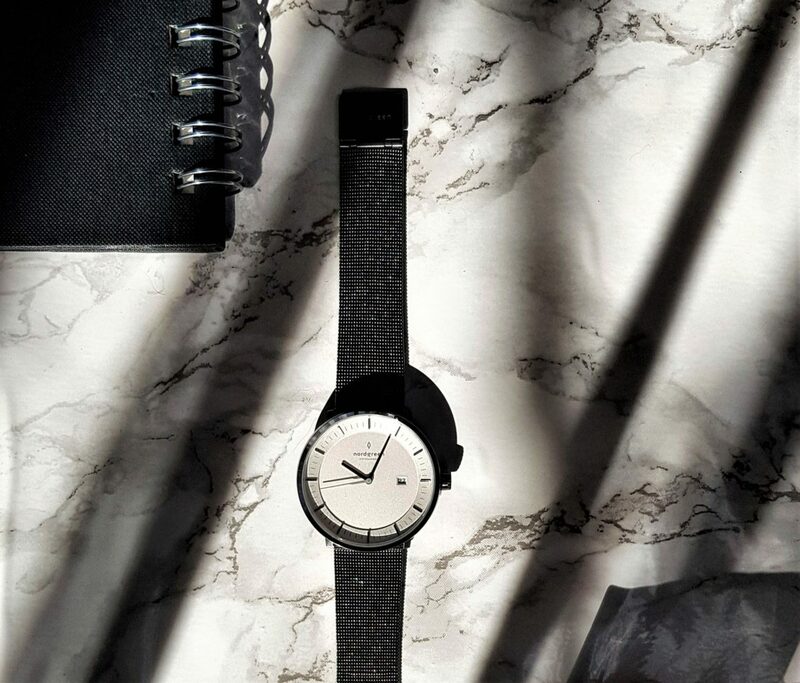 As such, the Danish watch brand have partnered with three global NGOs to create tangible change in the fields of health, education, and environment. Be part of the Nordgreen story: with each watch purchased, you have the unique ability to choose which cause you would like to support. Access to clean water, a clean environment, and a full education should be a right for all, and it is important at Nordgreen that their watches inspire a connection, not just between watch and owner, but amongst everyone. 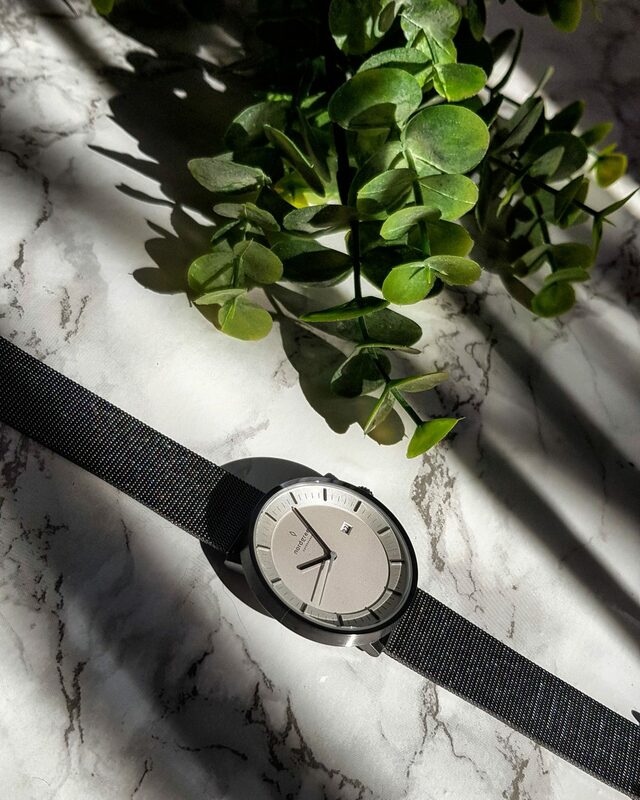 The Nordgreen Philosopher watch with gun metal mesh is the new statement piece within my contemporary watch collection. Taking pride of place on my wrist the Philosopher watch’s two-piece dial and asymmetric second hand combine to create a truly unique design. The Nordgreen watch design embodies the brands health, social environmental values as the deign celebrates our ability to learn from the past, act now and create a better future. The asymmetric second hand appears to continuously slice through time and is designed to remind of exactly this notion. 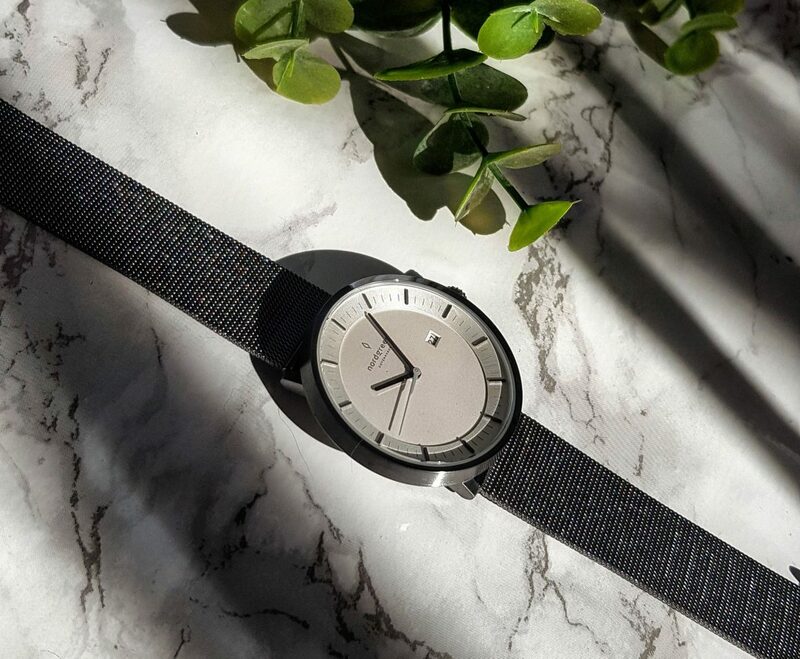 The inspired design continues to intrigue with a conical-shaped case that has a wider base than face, creating a sharp two piece dial that draws our eye to the centre of the timepiece, to the now! The elevated watch case, clean brushed look, and tugging lugs provide the finishing touches to the watch’s unique design. A further incredibly practical attribute to the design of the Philosopher watch is how the inter-changeable straps allow you to customise your Philosopher to every style; something I really appreciate as I mix and match my daily outfits. As modern minimalism filters through more and more into British culture we continually look to Scandanavian brands such as ASKET, Nudie Jeans and now Nordgreen, for, not only fashion, but lifestyle inspiration. Nordgreen and Jakob Wagner have created an aesthetically exquisite piece in the Philosopher watch and the message behind the brand is something we should all take the time to consider as we strive to take more responsibility.